Korean MMO-RPG Lost Ark has entered its open beta stage and fans are going wild. You can find a Lost Ark Online community on Reddit and there’s a Discord dedicated to this massively popular title, but unfortunately, it’s only open to Korean players, so here’s a link to where you can find more information on how to access the game. The open beta test doesn’t have an end date as of yet and no progress is expected to be lost at any point, with the aim of letting players keep their progress when the game eventually launches. You can find more information at the Lost Ark Online homepage here. Smilegate is introducing the game to the Chinese market and there’s a petition online to bring it to the West as soon as possible. 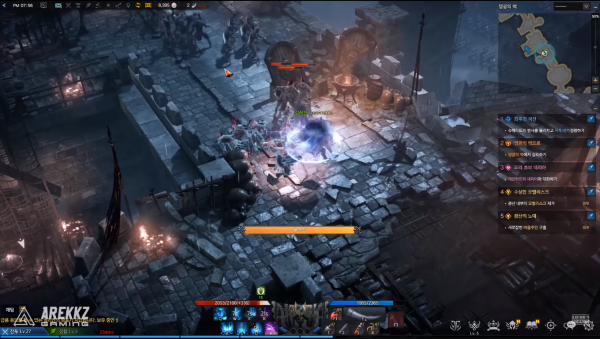 Our buddies at Arekkz gaming have been playing it, so take a look at their videos to see if this is the MMO-RPG for you. Vast World – Explore the huge world of Lost Ark Online, which is filled with perils, intense boss fights and strange new places. Tripod Skill System – Create a unique skill set by mixing different skill elements. Combos – Build up your character and make use of the eight skill systems to create chain combos. Customize Your Path – Choose what Life Skills you want to learn like fishing, mining, and digging to unearth some hidden treasures and dark secrets. Sailing – You’ll be sailing across the map on your own Ark to discover new lands, people and possibilities. The Colosseum – challenge other players to combat in 1v1 or 3v3 PvP matches in a battle arena. Island Ownership – Rule your own island! Mini Games – take a break at the local tavern and challenge players to a monster card game or keg drinking contests for a bit of light-hearted fun. As we previously mentioned, there are 6 different classes to choose from with a total of 18 different subclasses. Each class comes with its own special weapon or item. There are three types of levels in Lost Ark Online: Combat, Life and Exploration. The current maximum level for Combat is 60 and level 30 for Life, but there is no cap for Exploration as of yet. You’ll need to reach a base level of 30 before you can explore the cinematic dungeons and rightly so because they look hard as balls. Lost Ark Online – what’s it about? Long ago, heroes built and used the Ark to defeat Kazeros and his Demon Legion after being abandoned by their gods. The Ark fell into myth, and everything returned to how it should. The demons have reappeared, so it is up to you and your companions to traverse the map and find pieces of the missing Ark in order to rebuild it and defeat Kazeros and his six legions and close the Chaos Gate. Lost Ark Online boasts a wide variety of content including PvE raids and cinematic dungeons, a PvP arena and other social activities such as island conquering and decorating, gathering resources and crafting. Discovery is one of the key components, as you traverse the map looking for ways to rebuild the Ark, interact with NPCs and discover the wealth of quests hidden along the way.